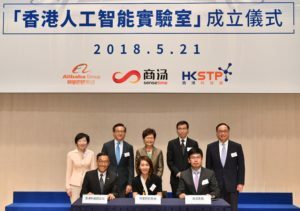 Alibaba Group Holding Limited , SenseTime and Hong Kong Science and Technology Parks Corporation (HKSTP) announced the launch of The HKAI Lab on May 21. The HKAI Lab aims to advance the frontiers of AI, empower startups to commercialise their new inventions, and inspire new ideas and knowledge sharing among academics, scientists and entrepreneurs in the field of AI. Alibaba Hong Kong Entrepreneurs Fund and SenseTime are providing funding for the operation of the Lab and it is a not for profit initiative. A six-month Accelerator Programme was also annouced at the launch event at HKSTP. The Programme will provide funding, AI technologies, network and working space to prospective AI startups in Hong Kong in an effort to cultivate a local community of talent and startups in AI and data science. Starting September 2018, the Programme will offer two intakes per year, providing funding and resources to about 10 successful startup applicants per intake class. SenseTime will provide deep learning platform and AI solutions to prospective startups. They will also obtain cloud computing services, machine learning platform, and IT support from Alibaba Cloud, as well as access to technologies developed by Alibaba DAMO Academy, a global research programme created by Alibaba Group. Start ups will also receive advice from the Lab’s advisory board which consists of leading AI scientists, entrepreneurs and academics. Through the Programme and incubation support from the HKSTP’s Incu-Tech program, startups enrolled will receive free working space from HKSTP. The Programme will start accepting applications from mid-June 2018. “AI is a major technology focus for HKSTP. Today, we are pleased to witness the launch of the HK AI Lab. The collaboration builds on the respective strengths of Alibaba, SenseTime and HKSTP, and also serves as a showcase of the partnership among the industry, academia, research and public bodies to drive innovation and technology,” added Mrs. Fanny Law, Chairperson of HKSTP.